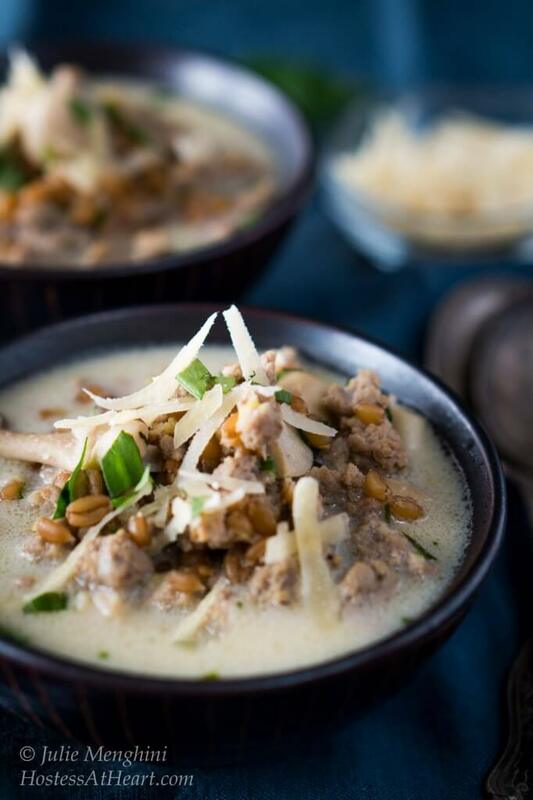 Ground Turkey and Spelt Skillet is a quick and easy meal that tastes rich and delicious without all of the fat and calories. Spelt berries make this dish a great source for whole grain fiber. 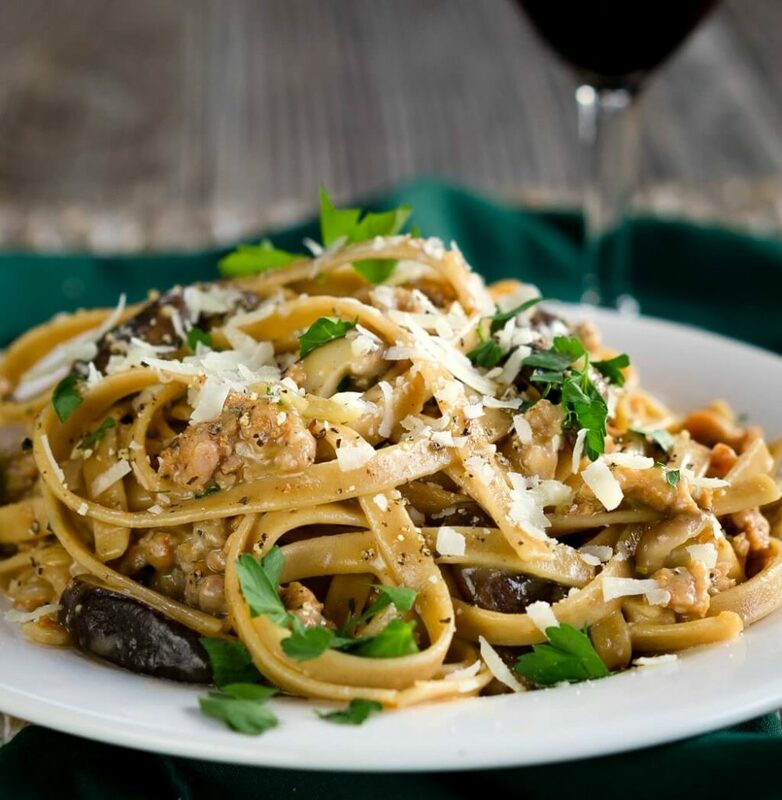 A couple of years ago, I decided that I was going to expand our whole grain horizon, and tried farro in my Farro with Mushrooms and Thyme recipe. John loved it which is usually a true test for me. I’ll eat about anything, but that’s not the case with him. Since that was such a success, my next attempt was Spelt Bread. It was truly delicious so I was confident that I could use Spelt berries in a recipe. 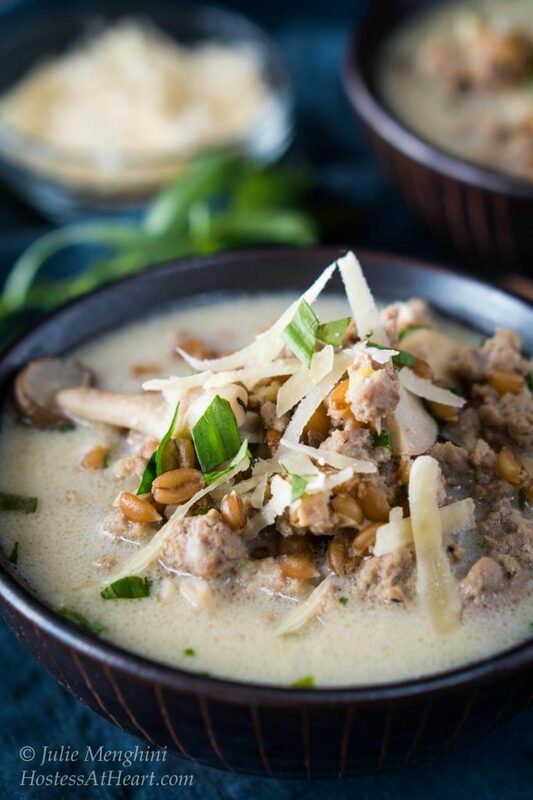 This Ground Turkey Spelt Skillet recipe is quick, easy, healthy and absolutely delicious. When I was developing this dish, I originally wanted to try Freekah, which is an ancient grain made from roasting green wheat. I couldn’t find it anywhere. I figured if I couldn’t find it you might have trouble too. John and I just love the texture and flavor of spelt. It reminded me of farro but the flavor does differ. I love making a recipe that looks like it’s full of cream which means it tastes good right? I also like making a one pot meal which means less clean up! This is an “almost” one pot meal that you can put together in no time. The spelt berries need to soak anywhere from 1 hour to overnight so you’ll want to plan ahead a little bit. 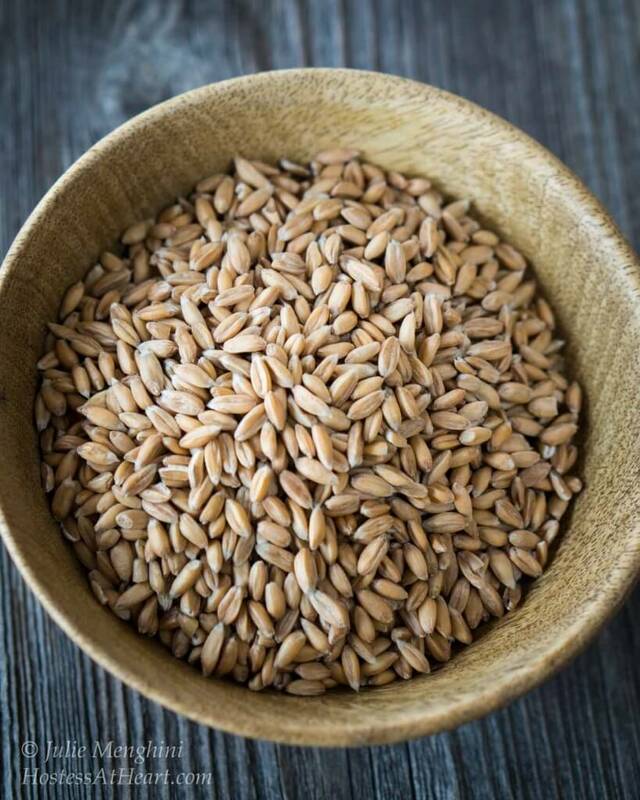 You can easily substitute the spelt with other grains such as barley, farro, or wild rice. This Ground Turkey and Spelt Skillet is a quick and easy meal that tastes rich and delicious without all of the fat and calories. Soak spelt berries for 1 hour to overnight in 1 1/2 cups of water or more if needed to cover berries. Heat spelt and soaking water in a saucepan. Bring to a boil and then turn to simmer. Cook covered for 45 minutes or until tender. Drain. In a large skillet, brown turkey, leek and mushrooms. Add garlic and cook 1 more minute. In a small dish mix arrowroot with 1/4 cup of water. Stir or whisk to combine until smooth. Add to turkey and turn down heat to simmer for 5 minutes. Stir in cheese, sour cream and spelt berries. Ingredients will thicken as they sit. Garnish with additional tarragon if desired. 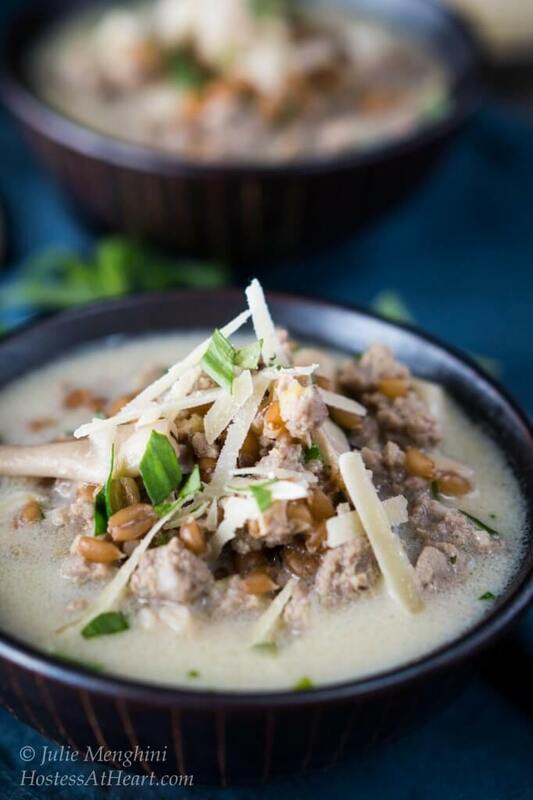 This is a wholesome delicious dish that tastes like some of my favorite creamy dishes. 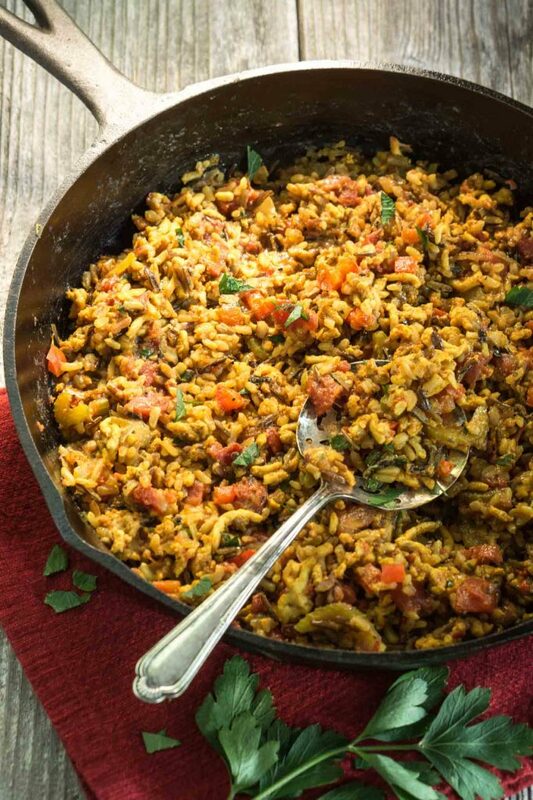 Here are a few more dishes that are full of whole grains that we love! Do you have a favorite way to include whole grains in your dishes? I’d love to hear about your ideas! Just drop me a comment below. I didn’t even know what spelt was! I love learning about new ingredients. This soup looks delicious, Julie! And it seems pretty healthy, too. I agree with you about creaminess making a soup look good. Thanks for sharing your recipe! Thanks for stopping by Shari! 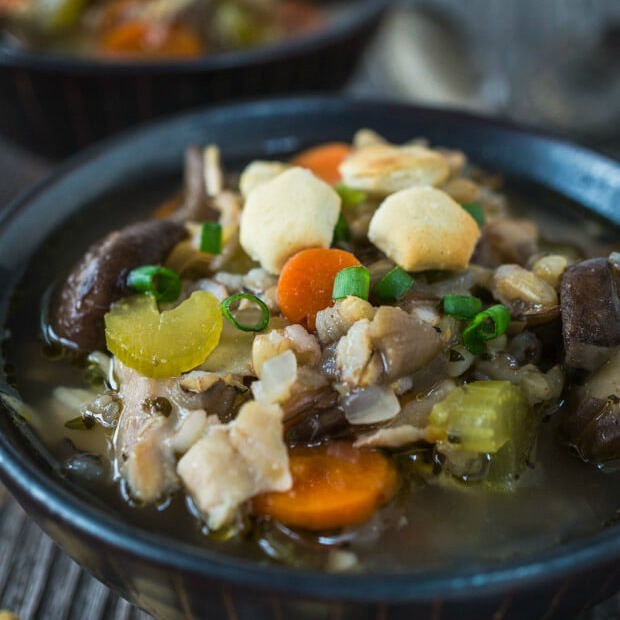 I love spelt and farro and it really gives soups a meaty quality. I’d choose it over rice or barley. This looks so good! Spelt is definitely on my list to try though I never see it. Must look again! Thank you Caroline! We just love it. I make it more than rice these days. Farro is a great sub if you have trouble finding it. Enjoy your day! Hi was looking for Freekah the other day and couldn’t find any. Grains are so good and this recipe is great 🙂 Have a good week ahead! Thank you, Petra! I hope you have a wonderful week too. 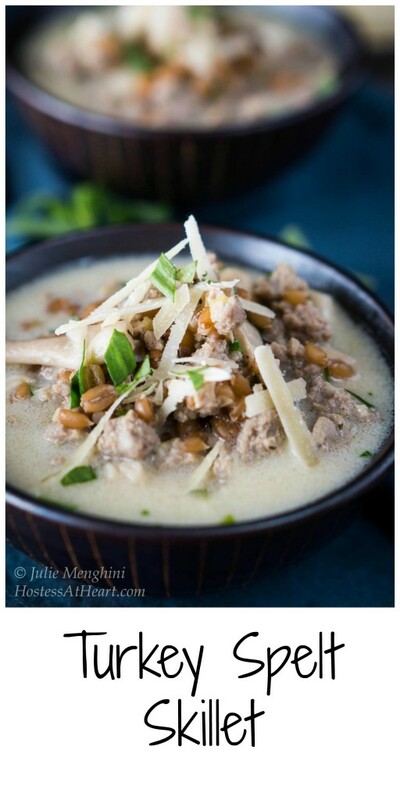 Mmmm, great recipe, and super awesome photos, Julie! Sounds delicious, Julie! I’ve never made anything with spelt–it looks so good! Thanks Nancy! It’s a great alternative to barley or rice. I hope you are haveing a wonderful weekend! It is so good Judi, I know you would love farro or spelt. Thank you Lily! I found mine in the health section of the grocery store. I think that Bob’s Red Mill is the brand our store carries? This dish looks hearty & delicious. Have a wonderful weekend Julie. It looks amazing Julie… I love spelt, but I have never thought to use it with turkey! Thanks a lot for sharing! Thank you. I hope you have a wonderful weekend! I love farro and would imagine that I would love spelt too. This sounds like a delicious and comforting cold-weather meal. Just what I need today! 🙂 BTW- I can get my husband to eat anything if it looks creamy… It’s true, if it looks creamy, it has to be delicious! Thank you Josette! The spelt is a lot like the farro, it’s just a bit larger grain, and if you love farro, you’ll love spelt. Thank you so much for hosting this week’s FF! This looks like an incredible meal Julie! Love all the flavors AND it looks beautiful 🙂 The photos make it look even more amazing! Love the addition of Spelt. Thank you Dini! I appreciate your photo comment, it’s always a work in progress. Enjoy your weekend! This looks so yummy Julie! I would really like to try spelt and this sounds like the perfect recipe! Thank you Lynz! I love it too! Thank you Chitra! So sweet of you to stop by! Very different. I too would be wary of something so new to me. Maybe in a restaurant first! It does look like a soup. Thank you Donna! It had more of a creamy texture than a soup texture once I allowed it to cool a bit. I am kind of an adventurer in the kitchen, and somethings work and somethings don’t. I would never tell you that I liked something that I didn’t either. Enjoy your day and thanks for stopping by! Thanks Jess! I love the spelt and farro. It’s a great alternative to rice or pasta. I know what you’ve talking about though. It took me awhile to venture out and try these grains. I’ve loved everyone of them. A bowl full of yuminess and nourishment Julie. Love all those healthy flavors, including the ground turkey. We cook a lot with ground turkey too. I must try those grains, I’ve been reading about them just about everywhere. Can you get it in a regular grocery store or a health food store? Thank you Loretta! I got the spelt berries at Whole Foods. It really is similar to farro but just a little bigger grain and has a delightful op when you bite into it. We really enjoyed it. I could have sworn that was farro in the dish…but surprise, it’s spelt! I’ve yet to incorporate spelt in my cooking repertoire, but after reading through your recipe I think it’s time… looks fabulous, Julie! Thank you Nancy! Spelt and Farro are very much a like. The Spelt berry is bigger than farro, and has a great little pop when you bite into it.